The final months of Bobby Sands, the Irish Republican Army activist who protested his treatment at the hands of British prison guards with a hunger strike. 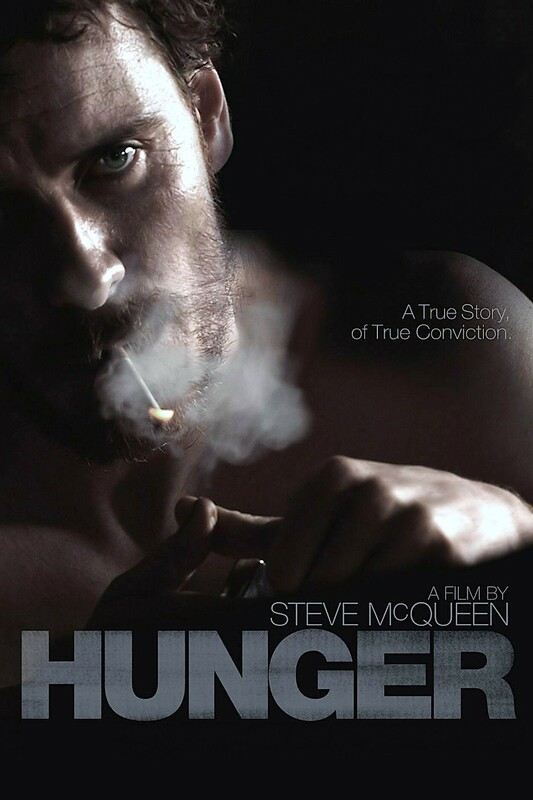 Hunger is the directorial debut from Irish director Steve McQueen, co-written by Enda Walsh. It premiered in the Un Certain Regard section of the 2008 Cannes Film Festival where McQueen was awarded the Caméra d'Or award for best first feature film. Set in 1981, the film chronicles the last days of Bobby Sands, and the horrifying conditions of his fellow inmates inside the notorious Maze prison. This is an astonishing film, both as an outright visually stylish display of art, and a raw and visceral, quite often uncomfortable to watch, true sequence of events. It's divided into three distinct parts, the first details the harrowing conditions inside cell block H. As the film opens we are introduced to Raymond Lohan (Stuart Graham) an officer of the prison as he goes about his morning routine. There's a quiet and deliberate way each shot is presented that in a brief amount of time paints the full picture of this character, almost entirely wordlessly. Soon we watch new inmate Davey Gillen (Brian Milligan) brought into the prison, and he joins the 'blanket protest', refusing to wear a criminal's uniform, stripping down naked and taking only a blanket. He is brought to his cell, already occupied by another prisoner Gerry Campbell (Liam McMahon), and this is our first glimpse of the gruesome and revolting conditions. The camera slowly pans across the cell, where the walls are completely covered in smeared excrement and chunks of undigested food, like some perverse expressionist painting. The images often so disgusting I actually found myself unconsciously holding my breath several times. McQueen proceeds to document one of the most immersive accounts of prison life ever put to film, one that evokes in me the same state of mind found in Bresson's A Man Escaped. The mundane daily rigors, the clever and innovative smuggling tricks, the oppressive treatment, and the harsh unflinching brutality. McQueen warps time masterfully and at the end of this first act, it feels like we've been in the cells with these guys far longer than the half hour or so that's passed. The other thing he does brilliantly is, he doesn't even introduce the main character Bobby Sands (Michael Fassbender) until near the end of this first act, taking time to meticulously lay down the foundation and atmosphere before switching the focus over to Sands. I've seen Fassbender's name attached to what seems like every second film released this year, and I've seen him in several films before this, but for some reason I've never really noticed him as an actor before. After seeing this performance, all that is changed. The second act of Hunger is a drastic change of style and pace, but so riveting that at first it's not even noticeable how seemingly out of place it is. Where all the dialog in the first part was purely incidental leaving the images to tell the story, this act is all dialog. A single scene of a conversation between Sands and his priest Father Dominic Moran (Liam Cunningham) in the dimly lit prison visiting room, as Sands declares his intention to go on a hunger strike. What makes this scene amazing is it includes a 17-minute long single take, which technically is nothing special since the camera never moves the whole time, but the acting from both Fassbender and Cunningham is so natural and quietly intense, that there is no need for a cut. But the cut does come and it is perfectly edited jumping to a close up of Fassbender as he gets into the heart of a moving monologue, at the end of which we can perfectly understand and even sympathize with his character's convictions. The last part of the film begins with another lengthy static shot, the camera placed at the end of a corridor as an officer pours bleach down it's length, soaked in puddles of prisoners' urine seeping out from under the cell doors. We then watch for several minutes as he proceeds to sweep the entire hallway from the far end towards the camera. It's a shot that is mystifying and frustrating at the same time, on the one hand it serves as a calm before the storm and to let the gravity of the conversation we just heard sink in, and the other it could come across as the director offensively sweeping piss at the audience. It concludes with a gradual and very graphic and unsettling dramatization of Sands' last 66 days on hunger strike, his wasting away made even more disturbing by Fassbender's 35 pound weight loss. Hunger is at times perhaps a bit uneven, and at others as senselessly ugly and nasty as it gets. However difficult it may be to take, this is one of the most powerful and impressive directorial debuts in recent memory, filled with images that will stick with me for a very long time. "paints the full picture of this character, almost entirely wordlessly", huh? I have a thing for movies that are able to do that well. I first saw Fassbender in Inglourious Basterds  and he made his mark in my mind as an excellent actor. It helps that he spoke German and English so fluently. I like languages. I really thought this film was beautifully done, but agree with you that it was uneven at times. I loved the long scene where he is discussing with the priest why he is going to do the hunger strike--great acting. Never heard of it, but now I want to watch it. I love this film. So many great moments. One of my favourites being the the great conversation between Sands and the priest. It sounds uncomfortable, well made, quite possibly depressing. That draws me in all in it's own. It's so recent too, I feel like I should've known about it. It never really got a release beyond festival screenings. He never stood out to me in Inglourious Basterds I think because of all the other great performances going on. That scene is definitely my high point of the film. Amazing when you think of the amount of preparation and dedication required by the actors to pull that off. This is the film that apparently made Michael Fassbender the hot commodity he is today. As much as I'd like to view Steve McQueen's first film (never mind 'Shame' which I hear is equally uncomfortable), I'm not sure how much enjoyment I'd get out of watching this. I understand that's not always the goal, but this does nothing for me. I don't always feel that way about great prison films. For example Un Prophete, that was an epic film that to me was entertainment, not so much an ordeal that I could relate to. Yeah the guy is everywhere now. I also understand why you would want to avoid watching this. Thanks for the comment though.